Everyone has the standard set of kitchen appliances. They have the refrigerator, oven, microwave etc. However, there are so many other appliances accessories that are useful in the kitchen. Here we will look at a few that many will find useful and are available on any online shopping portal. This is not referring to the handheld peeler to skin fruits and vegetables. The rotating potato peeler will completely do the painful task of peeling a potato in a few turns of the handle. It takes just a few seconds to peel a potato and a whole bag can be done in minutes. This is an appliance that a lot of people did not know they needed. It was popularized by the Gluten free movement as they needed alternatives for spaghetti etc. 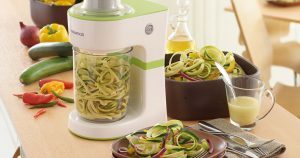 With the spiralizer, you can make noodles and spaghetti out of Zucchini and other vegetables. The different between a standard juicer and a cold pressed juicer is that that the latter retains more nutrients and fiber. These can juice absolutely anything including greens and herbs. A popular use is to make combinations of green smoothies. There are cooking sheets which can be placed over pans and dishes which act as a layer under the food. This prevents the need to clean up the pans of grime and burnt food as the cooking sheet can be thrown. It also protects the pan and will increase the lifetime of non-stick cookware. These are quite easy to when online discount shopping.